With the increasing complexity and volume of cyberattacks, organizations must have the capacity to adapt quickly and confidently under changing conditions. Accelerating incident response times to safeguard the organization's infrastructure and data is paramount. Achieving this requires a thoughtful plan- one that addresses the security ecosystem, incorporates security orchestration and automation, and provides adaptive workflows to empower the security analysts. 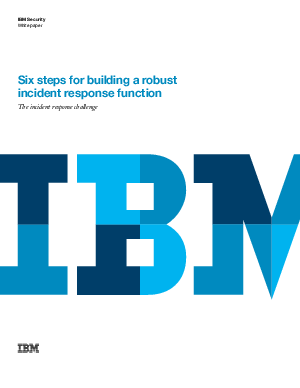 In the white paper "Six Steps for Building a Robust Incident Response Function" IBM Resilient provides a framework for security teams to build a strong incident response program and deliver organization-wide coordination and optimizations to accomplish these goals.